Imagine your immune system, which is supposed to protect you, attacking your own tissues and organs. That sums up lupus, a systemic autoimmune disease. The inflammation it causes can affect many different systems – your joints, skin, kidneys, brain, heart and more. We learn more about lupus – and a clinical trial aimed at catching it before it surfaces – from Dr. Nancy Olsen, chief of the Division of Rheumatology at Penn State Health Milton S. Hershey Medical Center. Description – The video begins inside a conference room at Penn State College of Medicine. Two people are standing next to each other. Standing from left to right is Dr. Nancy Olson and Scott Gilbert. Scott Gilbert – From Penn State Health, this is Ask Us Anything About Lupus. I’m Scott Gilbert. Now, imagine your immune system, which is supposed to protect you, attacking your own tissues and organs, that sums up lupus, a systemic autoimmune disease. The inflammation it causes can affect many different systems, your joints, your skin, your kidneys, your brain, your heart, and even more. So, here to tell us more about lupus, from both a medical and research perspective, is Dr. Nancy Olson. She’s chief of the division of rheumatology here at Penn State Health Milton S. Hershey Medical Center. Dr. Olson, thank you for your time today. Let’s start by talking about what we know about what lupus does to somebody’s immune system. What’s happening inside the body in lupus? Dr. Nancy Olson – Sure, yes, so this is an autoimmune disease. Lupus is an autoimmune syndrome or disease, which means the auto part means that the immune system is attacking self. It’s attacking elements within the body itself rather than being deployed outwards to protect us from what’s out there, usually like infectious, for example. So, for reasons we don’t understand, the orientation of the immune system is kind of turned around in lupus. Scott Gilbert – And; therefore, lupus is also very hard to diagnose, right, because the symptoms can really be somewhat vague. Dr. Nancy Olson – Oh, they could be — they could be vague. We know now that there’s a period of rather insidious symptomatology that builds up different symptoms that then occurs maybe even years before it is actually recognized as lupus. Scott Gilbert – Now, with such a wide range of systems affected, I imagine there’s a wide range of symptoms, too. Is it possible to talk about what some of the most common ones are? Dr. Nancy Olson – Oh sure, it’s very wide ranging. This is systemic, meaning it could affect almost every system in the body, but some are more common than others. So, for example, skin, patients with lupus are often sensitive to sun exposure. They develop rashes. So, they may show up at a dermatologist with just a skin rash and not realize they have a systemic component. It can — it can also alter things in the joints so that they can get what looks like an arthritis. Come to us, as rheumatologists, and say, well, it looks like a type of arthritis. It may attack an organ, like the kidneys, and they end up at a nephrologist or a renal or a kidney doctor. Presentations make it very hard to tie it together sometimes. Scott Gilbert – Yeah, it can present as something, that’s something. You’re watching Ask Us Anything About Lupus from Penn State Health and Rheumatology here at the Milton S. Hershey Medical Center. We welcome your questions, which you can put in the comment section below this Facebook post, even if you’re watching this live or after the fact on playback, you can just add your comments there, and we’ll make sure we get some answers for you. So, what you’re saying is, lupus could look completely different in two people who present with it, but does that mean that some other symptoms will eventually likely be shared as it progresses or maybe not? Dr. Nancy Olson – You know, it’s very variable. So, some people do end up with a more mild form of lupus. It’s primarily in their skin. Some people start with the skin and it ends up doing more things to their organs, like the kidneys. And one of the things we’re trying to understand in research is how to predict in a given individual what is your prognosis? What are you looking for in the future? And what should we be prepared to treat? Scott Gilbert – Now, I don’t want to make everybody who has a skin rash think, uh-oh, I think I might have lupus. So, let’s put it into some context and talk about how common or uncommon it is. Dr. Nancy Olson – Well, lupus itself is a pretty uncommon disease. So, we estimate maybe one in two to 3000 persons has lupus. So, that makes it relatively rare. On the other hand, there are certain types of individuals in whom there is a higher risk and we might be more concerned. Lupus is a condition that’s more seen in young people, for example, than older people. So, even as you age, one of the few conditions you probably age out of in terms of risk is lupus. But, you know, young people are people who often aren’t thinking that they might have a chronic condition and often aren’t seeking medical attention. Scott Gilbert – Now, given that it presents in so many different ways with different symptoms, does that mean that the prognosis is different for different patients, or does the disease tend to follow a similar track in most people? Dr. Nancy Olson – Oh, it’s definitely different in different patients. So, in this era now where we’re trying to develop personalized medicine and determine what treatment and what pattern is working for each individual patient, that’s a challenge in lupus because it’s so different, but it’s very important because some of these individuals are not at risk for some of the other complications. And we’re trying to figure out how to – how to tell you that on an individual basis. Not quite there yet, but that’s an important research aim. Scott Gilbert – And so, lupus can be fatal. Is that to say that it is the complications from lupus that can prove fatal, it’s not the disease itself? Dr. Nancy Olson – A little bit of both. And I would want to emphasize that in terms of outcomes for lupus, they have improved very much over the last 20 years so that we would say that the rates of people actually dying as a result of their lupus have become very rare actually. We hope that we don’t see that very often. Most — I tell many of my patients, when you’re out there in class or you’re going to the store, there’s people in the grocery store that also have lupus, but they look like you, they look fine. And so, you don’t have to feel like you have lupus written on your forehead when you go outside. Scott Gilbert – You’re watching Ask Us Anything About Lupus from Penn State Health. Your questions for Dr. Nancy Olson, our chief of the division of rheumatology here at the Milton S. Hershey Medical Center are welcome. Just put them in the comment field below this Facebook post. That’s what Holly did. Here’s her question. She says, is there a specific blood test for lupus or do you just rule out other illnesses to get to the diagnosis? It sounds like she’s saying is it kind of a process of elimination or is there something definitive here? Dr. Nancy Olson – Well, there are blood tests, but they’re not definitive. So, the most common blood test is the ANA test, the anti-nuclear antibody test. That test will pick up pretty much everybody who has lupus. But, on the other hand, most people with that test don’t actually have lupus, because it is still pretty rare. So, I view that as sort of the funnel that would get you in to get attention, and then figure out if there’s anything to be concerned about or not. There may not be anything to be concerned about. So, we’re trying to develop better ways of doing blood tests that would be more specific for lupus, unfortunately, we aren’t quite there yet, but we do have pretty good ways to screen you for lupus. If that ANA test is not present, there is a less than 1% chance you have lupus. Scott Gilbert – Now, for rheumatologists like you, I’m thinking part of the struggle must be making sure that other providers who treat that range of other illnesses are armed with the knowledge they need to know when to refer somebody to a rheumatologist possibly, how tough is that? Dr. Nancy Olson – That’s very difficult, because that test, that ANA test, is done widely. And, as I said, most of those people don’t have lupus. So, but most of them are actually referred to see us, and we do try very hard to figure out in each case what to tell you about how concerned you should be about that test or not, because in many cases it’s not a test to be concerned about. Scott Gilbert – From genetics to the environment, what do we know about the causes of lupus and what don’t we know? Dr. Nancy Olson – Well, certainly genetics is an important component of the risk for lupus. Of all of the other conditions we see in rheumatology, this is one of the highest ones. It doesn’t mean that because your sister has lupus, you’re going to have lupus. But we all need to know what’s in our family histories and be aware of what our risks. On the other hand, there are probably environmental factors. More women than men get lupus. Things women are exposed to, it could include hormonal influences, pregnancies, and there’s probably many other things we don’t understand. Some of our drugs we recognize don’t work as well if you happen to smoke cigarettes. So, it’s another reason not to smoke cigarettes. Scott Gilbert – Yeah, a good one, too. So, you mentioned that there are some risk factors, gender. You mentioned before that actually it is an earlier onset type illness. Dr. Nancy Olson – Yes, that’s true. So, even children present with lupus. So, in the pediatric rheumatology population there are children who present with significant lupus, and we see a lot of young people with lupus. That’s why I mentioned the classroom example, that people are afraid they’ll go back to college and they’ll be sitting in class and everybody must know I have lupus, but it’s not really the case. On the other hand, if an older woman, postmenopausal woman, comes in and says my daughter was diagnosed with lupus and I am concerned, I would tell that person that it’s a lower probability that you’re going to get lupus or any of those related conditions, because with age it decreases. Scott Gilbert – You’re watching Ask Us Anything About Lupus from Penn State Health. Dr. Nancy Olson, our chief for the division of rheumatology here at the Milton S. Hershey Medical Center, welcomes your questions and your comments. Just add them to the comment field. And if you find this interview useful, as we hope you do, click on like, or better yet, click on the share button and share it on your Facebook page. We talked before about some complications. Can you walk us through some of the most common complications of lupus? Dr. Nancy Olson – Well, actually skin is a very involved organ system in lupus, and it’s not one to be treated lightly, because your skin is a very important protective barrier against everything that we encounter every day. So, there are actual specialists in dermatology who are very careful about protecting the skin and treating it with, sometimes topical medicines, but sometimes medicines that are taken systemically. Probably the most worrisome complication of lupus is if it gets to the kidneys. Your kidney is definitely a vital organ that you really want to keep working. And we have now very effective treatments for kidney involvement in lupus, but it is important to find that before there’s been a lot of damage to the kidney. Scott Gilbert – So, is it more so a matter, when it comes to treating lupus, is it about trying to treat the symptoms as they come up or trying to get inside the body to stem certain things from happening in the first place? Dr. Nancy Olson – Yes, we would like to certainly get at things, do treatments before there’s damage, because damage means, by definition, that it’s not reversible, back to being normal. So, if you’ve had some damage to the kidney, we could still improve the kidney function, but it won’t go all the way back to normal. So, it’s enticing to know that there are some changes that happen even in the blood circulation that we can identify before some of these events occur, and that we might be able, in the future, to identify when this incipient process is coming up, and could it be turned off before it causes damage. Scott Gilbert – Yeah, so, that sounds like that’s really at the root of a lot of research. I know the Hershey Medical Center is the lead site for a multicenter clinical trial. And this trial is actually aimed at finding ways to delay the progression of lupus. Can you tell us a little bit about that and what kind of therapies that could theoretically lead to? Dr. Nancy Olson – Yes, certainly. We — recognizing that there are measures in the blood that come up before lupus, this is kind of a body of research that’s developed over the last 10 or 15 years, triggered us to think that maybe we could intervene in that phase and see if we could prevent progression to actual lupus. So, we’re conducting a trial called The Smile Trial for the study of antimalarials in incomplete lupus erythematosus, which means incomplete. You have a few warning signs of lupus, but you don’t actually have the full disease. So, that’s the point at which we would like to know if we intervened with a medication, the medication we’re using is Plaquenil or hydroxychloroquine, a very old medication, been around a long time for lupus. There are some pieces of evidence that suggest use of Plaquenil could, I think of it not changing the immune response, but making it behave more normally and maybe not causing some of the auto antibodies and the other things we measure in lupus, and would that prevent damage? So, we’re very interested in finding people who have these early phase markers, they have the ANA test, they might have a skin rash, but nobody really wants to say they already have lupus, and see if we could intervene and make a difference in the outcome. Scott Gilbert – It sounds like a logical next step. What — I’m curious, what led you to explore this particular path in terms of research? Dr. Nancy Olson – One of the more interesting pieces of data was generated by some colleagues of mine in Oklahoma. They were able to get serum samples from individuals that had been, for various reasons, stored away in a freezer prior to anybody recognizing that they had lupus. So, they went back in these samples to measure some of the auto antibodies and other measurements that we carry out on people with lupus, and found out that there was a rise in the numbers of these up to the point when they actually were recognized as having lupus. So, it’s suggested there was a window, an opportunity to get in early prior to the onset of the disease and see if those changes in the immune response could be — could be altered so that they wouldn’t progress. I think that was the key piece of data that really made us think that maybe we should try to do something. Scott Gilbert – It’s all about trying to make sure that it’s less about treating symptoms and more about trying to head off these things from happening in the first place. Dr. Nancy Olson – Yes, absolutely, yeah, prevent damage to anything that’s critical. Scott Gilbert – Sure. We have a question from Melissa. Now, Melissa says, I’m a lupus patient with a family history of kidney disease not related to lupus. I currently have no kidney issues, but am I at a higher risk? Dr. Nancy Olson – If those other family members’ kidney disease were due to completely unrelated things, for example, diabetes, which is a very common cause of kidney problems, I would say that’s unrelated to the lupus. On the other hand, if you have lupus, we, you know, once or twice a year check kidney function in various ways to make sure that none of that is developing. The longer a time a person goes without developing those complications, the less likely they will have onset. So, certainly if the other family members’ kidney diseases were from other — those more common causes of kidney problems, it’s not probably related to her lupus. Scott Gilbert – So, I wanted to get back to kind of the patient perspective, because, you know, I think the big question for a lot of folks may be, you know, how do they kind of help the family doctor and, you know, advocate for themselves in a situation where maybe they should be seen by a rheumatologist? What, again, are kind of those overarching signs that people should keep in mind that maybe it’s time for them to see a specialist because this may be a factor? Dr. Nancy Olson – That’s definitely challenging. I would say one big one is you do need to know your family history. And I would say if you have some vague symptoms and your sister or your mother had very significant lupus, I would put that very high up on the list of something you should be concerned about, just like anything in family history. It’s very important to know for each of us what genes we might have. I think otherwise, if something is persistent, I mean it’s kind of if you — if you say skin rash, a lot of people are going to go out now in the spring and get red faces from exposure to the sun, but if you can explain that, that was something to do with your behavior, that you were sitting at the beach and it went away, then that’s probably not something that needs long-term follow up. But if it persisted and it was unusual for you, I would bring it to the attention of your physician. Scott Gilbert – So, it sounds like if some of these symptoms surface and there’s really no logical reason as to why, that may raise a red flag? Dr. Nancy Olson – Yes, I think that’s a good way to put it. Scott Gilbert – Okay, well, again, we’ll make sure that we put some contact information in the comment field below this Facebook post for our division of rheumatology so you know how to get in touch with a specialist. Dr. Nancy Olson, chief of the division of rheumatology, thanks so much for your time today. Dr. Nancy Olson – Thank you. Thank you. Scott Gilbert – We appreciate it. 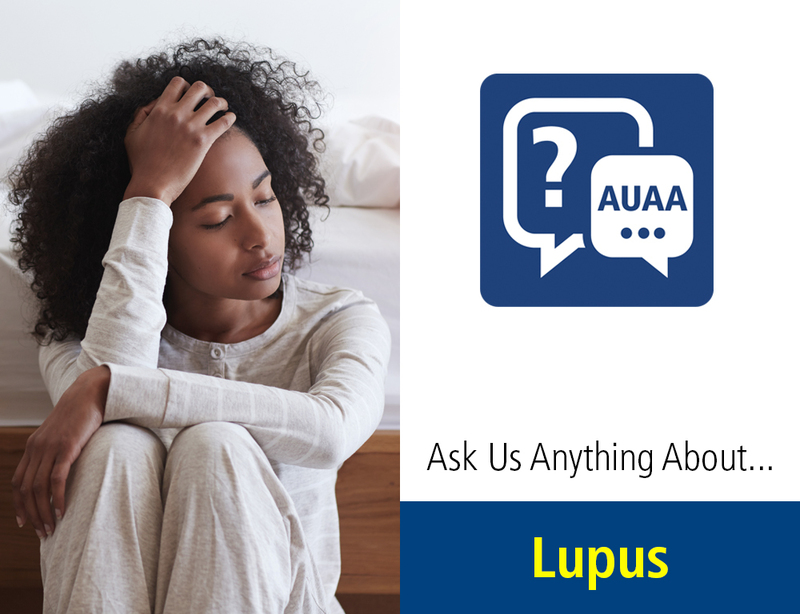 And we appreciate you watching Ask Us Anything About Lupus from Penn State Health.